In a large pot of salted boiling water, cook the noodles according to package instructions. Place the peanut butter, lime juice, sesame oil, chili paste, and sugar in a small bowl and mix well. 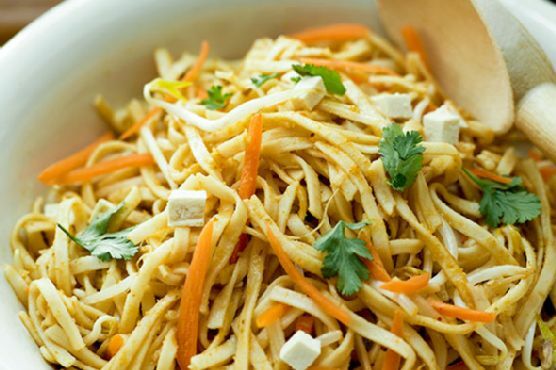 Combine the tofu, bean sprouts, carrots, and noodles in a large bowl, and pour the peanut sauce over it all. Toss well to coat. Garnish the Asian noodles and peanut dressing with fresh cilantro. The salad may be served chilled or at room temperature.